Cheap flights to Mexico: Cancun for €264! UPDATE 13.5.: new dates available for the same price: East Midlands-Cancun (21.5.-4.6.) 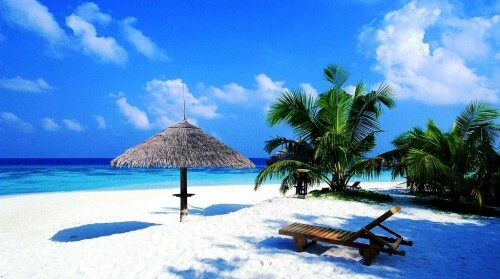 or London Gatwick-Cancun (29.5.-12.6.)! Here’s another amazing deal from Thomson! 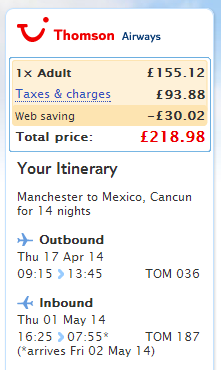 Return flights from East Midlands or Manchester to Cancun are now available for only €264 / 219 GBP! This price includes only 5 kg cabin luggage but you can purchase extra 20 kg check in luggage for 70 GBP. We recommend to book just one extra luggage for two people and split the costs to save even more money! Cancun is full of luxurious yet super cheap hotels, so just compare the best deals with our hotel comparison page and book it ASAP. « Last minute Turkey: 1 week in 4* hotel with All Inclusive, flight, transfer for €188!